Wellington 2 ‹ Series 10 Reversions ‹ Flog It! Paul Martin brings the team to Windsor's Wellington College. Joined by Philip Serrell and Elizabeth Talbot, he discovers a collection of toys and some mosaic jewellery. Browse content similar to Wellington 2. Check below for episodes and series from the same categories and more! but we're not going to let rain dampen our spirits, are we? if their treasures are worth a few bob or not. Somebody in this queue is going home with an awful lot of money. I don't know who it's going to be, but stay tuned and you'll find out. so it's time to get this massive queue inside. All of these people have come here to ask that all-important question, which is? And if you're happy with the valuation, what are you going to do? will be taken off to auction later on in the programme. Elizabeth Talbot is already on the lookout for something eye-catching. Oh, my goodness, toys and toys and toys! You've collected all these, have you? and does regular antique phone-ins on BBC radio. which makes me go, "Oh!" I do clean that one, it's the only one I've cleaned. himself as a bit of a matchmaker. -They're military badges, aren't they? -Did you two know that you were both coming, or...? -That's just the wonder of television, eh? here's a glimpse of what's to come on today's programme. I...I really don't know what to say. -Well, hopefully you've learned something. Which of today's antiques will hit the hundreds? You'll just have to stay tuned in and find out. So, to our first item of the day, and it's with Philip Serrell. -Stuart, how are you doing? Do you not think you're a bit big for this? Well, I am slightly now. It's just a fabulous collection. I mean, were these bought for you when you were a little one? -Lord knows how old I was when I was given that. Laurel and Hardy... I just acquired them. -and he's like that bendy, sort of squidgy stuff, isn't he? And these are Corgi models. We've got Miss Piggy here from The Muppets, was that right? -That's an old Citroen Safari, isn't it? And these would probably be '70s. But who would... They were a bit sort of, "heavy," weren't they? you didn't really pay much attention to that. We've got Dougal, he was a bit of a hero of mine. -And that's Brian The Snail. -"Boing!" said Zebedee. You've got all these off pat, haven't you? Well, it's the thing I was brought up with as a child. I just think it's great fun, really, because they're not hugely valuable. -it's just a diecast toy, isn't it? -I'd sell the whole lot as one collection. and a fixed reserve of £30. So, what's going to replace your life in the Magic Roundabout? -Well, my other passion is actually movie musicals on the West End theatre. Well, that's good, it's a bit more grown up, that. -You can talk about that with some confidence with your mates, can't you? really, really well. Thank you so much for coming. It's not just Phil and Stuart who seem to have toys on their minds today. proof that "rememorabilia," as Phil calls it, is always popular. Let's get back to grown-up collectables now. Elizabeth has spotted a beautiful micro-mosaic brooch. A fine, quality piece of jewellery you have brought here today, Adrian. -Is it something you've inherited? It belonged to a good friend of mine's mother. after her first husband died in the First World War. little squares through computers and sort of building it back up. the last quarter of the 19th century. which a lot of Victorian jewellery would have. in a way which doesn't detract from the focus of the picture. who were very well known for the manufacture of such things. They often set them off in black, whether that be in jet or in ceramic, or in glass. And then this, although it's not marked, the big, gold mount. -there's been anything wrong with that. -That's great, yes, very nice. Micro-mosaic jewellery is extremely collectable these days. and I'd be tempted to put an auction estimate between £80-£120, really. I think it's more likely to be over £100 than under £100. -We'll do that, and I think that will find favour. who've come to meet us. Oh, Mo, what are you holding there? I like the look of that. -pepper pot. Isn't that lovely? How did you come by that? Well, my mother-in-law gave it to me, but originally it was her mother's. -Gosh. Can I have... Can I hold her? -I think she's really cute. -What's on the bottom? Oh, look, it's still got its cork stopper! This is a bit of earthenware, this is what is called faience, OK? It's not a pepperer, no, it's a sugar caster. -The holes are too fine. But she's definitely meant to be in the kitchen. but do you know what I love about this little thing? but because of the waisted shape. She's got this sort of bosom which is very much like Thora Hird. pine dresser in the kitchen, wouldn't it? Or something like that. A lot of people collect pottery like this. Purely because of the figure, purely because of that. Oh, right. We always thought it was a pepper pot, you see. -And we wondered if there was a salt pot somewhere to go with it. I'm sure they made versions like this, though. But the holes would have been slightly bigger. fetching £50, because of the novelty factor. -if you're happy... Do you want to sell it? -No, I love her too much. -Do you know what, for £50, I wouldn't part with her either. -And I'm so pleased, I'm so pleased you want to keep her. This is one that got away. This isn't "Flog It! ", is it? a pair of candlesticks owned by Jonathan. Do you know, when I first saw these, I got really, really excited. and I thought, "Wow, we are looking at a four-figure lot here." but what's all this bar code all about? Because I bought this from a charity shop. I thought I had a real bargain with it, so I bought it from them. You can be the expert now, all right? So, explain the hallmarks to me. and then the lion sign, it's silver. And what about the K, did you date it? Yeah, it's about 1930s, but I don't know the exact number. You're getting good at this, aren't you? -You knew that was silver, but the charity shop didn't? -Five pounds for a pair. -Five pounds for a pair? Well, Jonathan, I think we taught you really well. I think we can put £150-£250 on these. So, there's potentially like £150, £200 profit in these for you. What you going to spend the money on? -At the moment, my wife is pregnant. -Really? Don't look at me. she is due next month, so probably the money will go to the baby. Oh, that's brilliant, isn't it? And do you know what? If you had a little baby boy, you could call it Philip. Philip? No, it's a girl, sorry. -Sally, shouldn't you be at work? Sally actually works here at Wellington College. What do you do here? -I'm PA to the bursar. -How long have you worked here? -I've worked here for 24 years. You must know every part of this wonderful school. I think I probably do. But I'm retiring at Christmas. I hope you're getting a nice watch, or a clock or something. My word. Tell me a little bit about the history of the Lalique bowl. It belonged to my grandmother, and my grandmother gave it to my mother, and my mother gave it to me. -So, it's been in the family for three generations? -And now you're telling me you want to sell it? -You keep it in the cupboard where you keep your shoes? -So, do you keep your shoes in the kitchen? Underneath the... In the bedroom? So, what's that doing in the bedroom, then? -I just think it's a safe place to keep, so it's all wrapped up. -Oh, I see. That's OK, OK.
when you talk about glass design. made during his lifetime were always stamped, "R Lalique,"
and you can see it moulded into the glass there, right at the centre. It's a wonderful, opalescent glass. It's not quite clear, so you can see little flecks of blue, sometimes yellows and sometimes green. If I hold that up to the light, you can see what I'm going on about. -And there's the stamp right in the middle, "Rene Lalique". Classic size, classic shape. 24 centimetres. it's not the rarest of designs. dragonflies, they are the ones that fetch the top money. Look down there and run your finger around the edge, go on. -There's not one chip, is there? -No, no, it's perfect. Isn't it? polished out, there's a little dink. Collectors are so fussy, it will put them off a bit. it's got to have an auction price guide of £200-£300. and hopefully will get the £300 top end. -But they have done 220, I saw one do 250. -Let's put a fixed reserve on at £200. -Don't let it go for a penny less. -Right, OK. OK, that's fine. Three generations here you're saying goodbye to. in the shoe cupboard for another pair of shoes. Highclere Castle, built by the third Earl of Carnarvon in 1842. It's everything a stately home should be. and is much in demand as a setting for costume dramas. in the history of the nation. of the only complete royal tomb of a pharaoh. And it was that of Tutankhamen. when I was filming here a few years ago. Lady Carnarvon, why did the fifth earl become interested in Egypt and Egyptology? He went to Egypt because he was really ill.
of places to go and he decided to go to Egypt. he would be there for a season and gone, like some sort of rich toff. And he became completely obsessed. and he discovered a mummified cat. -You know, he dug for three months. -He was actually mucking in as well? you wouldn't come up with anything at the end. They'd have disappeared off into the bazaars and sold it. -Did he know Carter at this stage? -No, never had met Carter. He was doing it all on his own. Everyone, as I said, thought he would get bored and go away. Talk me through some of the things you've got in the exhibition. I have arranged the exhibition thematically. or groups of faces and figures. from the tomb of Tetiky. giving offerings to the gods in his name. and it's 3,500 years old. It's amazing. about the great Chamberlain from Abydos. The line drawings and the hieroglyphs are so clear. but...they look as if they were. it's very special to have there as well. This is wonderful, this coffin. The children who come here love it. Oh, I bet they do! and took you on to the world of the resurrection, the next world. Were all the royal coffins highly decorated like this? But she could afford to be mummified. that was destined to make ripples across the world. So, when did Carter come on the scene, then? He met Howard Carter, I have now found out, in 1909.
who was head of the antiquities. out in Egypt, someone to be there and help him. they continued for five long years, with little reward. It was the last chance. Carnarvon was at this point running out of money. This was 1922, it was post the First World War. Just about to give up. For Carnarvon, it was the last shot. who rushed out to be there. and they chipped away at it. ..from another culture, another world. -saying, "What can you see?" -I know, "What can you see?" And turning around and saying, with a peephole, "Treasure." Wonderful things, what wonderful things. It just sounds like a movie, doesn't it? It really does, like a film set. -the inner chamber, did he? He got bitten by a mosquito, which ultimately led to his death. of amazingly equal thickness throughout. where Lord Carnarvon was bitten by the mosquito. was also responsible for Tutankhamen's death. So, there is some kind of curse going on, do you think? Well, I just think... Hold steady! What happened to all the treasure? All the treasures from Tutankhamen's tomb went to Cairo. What we have here is the remains of his collection, pre-Tutankhamen. -Tutankhamen is such an icon, isn't he? "we've got the story, we've got the story of the discovery." It's the treasure trail of all treasures. So, this is the famous mask, and obviously a replica of it. -But it's quite beautifully made. -It is an iconic image, isn't it? over wood, inside a sarcophagus, inside four different shrines. Well, it's time to put those valuations to the test. -feeling really nervous for our owners. Our experts are normally pretty good, aren't they? but as you know, anything can happen at auction. he has a hunch that nostalgia will help the sale go along. Elizabeth chose this Victorian micro-mosaic brooch. She is hoping its class and beauty will attract the bidders. We have a pair of 1930s candlesticks. which Phil thinks will easily sell for 30 times that amount. in the sale room will love it enough to give it a decent home. where they charge a seller's commission of 15%, plus VAT. if auctioneer Garth Lewis thinks Sally's Lalique can do the business. -and I think this Lalique bowl has it in abundance, don't you? -The name says it all. -It's an early one as well, Rene Lalique. It seems to be in pretty good order. There are one or two slight knife marks, I fancy, in the bottom there. -She did that, Sally did that. OK, well, we'll blame her. But it's very nice, it's an unusual design, the mistletoe design. It is in company with a couple of other Lalique lots in the sale. -Hopefully, the people will be here for it. -want to hear from the auctioneer. -Did I just say that? Which is good, isn't it? here today, because the toys are our first item up. I've just been joined by Philip. Unfortunately our owner cannot be with us. and hopefully they're going to reach the top end of the estimate. # We're in the money... # Are we? -I always thought Dougal was really cool, you know. -He was my favourite, Dougal. Miss Piggy is the most valuable one there. -Well, he told me. Because she's more collectable. -I... I really don't know what to say. -Well, hopefully you've learned something, because I have. Yes. I still like Dougal the best. what the bidders think, shall we? and, most memorably, Miss Piggy's car. So, I'm sure you've had a good look through. Interesting little lot. May I say 40 to start, please? £40. 30, if you like. I don't mind. Here we go. Someone's in. 30 bid, thank you. At 30... 32, now. 48, with the lady. New place. -He was right. He knows his Miss Piggy, doesn't he? -£60. On my left here at 60. Well, I have learnt something. Miss Piggy. That's where the money is. I wonder if Kermit the Frog was amongst the bidders. valued by Elizabeth at £80-£120. It belongs to Adrian here, who's just joined us in the nick of time. because I think this is pure quality. a strong field for collectors. You've got a nice sort of pictorial one, and condition is good. So, all these, it ticks all the boxes. It ticks the right boxes. Let's find out what the bidders think. Nice example of a small, oval micro-mosaic brooch. Decorated with a colonnaded Roman building. May we say 50 here, please? £50 for it. It's bid, thank you. At 50. Any further? -And five with the lady. -Good, someone down the front. -I'll come to you in a second. And five. 90. Five. 95. Was there a bid here? 95. Lady's bid. Are we all done? keep remembering when you want to invest in antiques. for bringing in such a great example. -Thank you, Paul, it's great. -Mid-estimate and a solid sale. We're on our way and the bidders are warming up. I've just been joined by Jonathan. It's great to see you again. On the day of the valuation, my wife was pregnant. Now she is three and a half months. -A wonderful baby, a little girl or boy? A little girl, and she's just over there, and there's your wife. Give us a wave, hello. How sweet. Her first auction, she's starting young. You never know, she could be a jewellery expert when she's older. it is a great time to sell. -I just bought it in the charity shop for £5. You got your eye through "Flog It! ", didn't you? -Yeah, I just learned through watching "Flog It!" a bit further, lots of inspiration. Good pair of early 20th-century silver sticks. Say £100 to start, please. Surely? 100 for them is bid, thank you. £240, well done. Well spotted, that's all I can say. If it's out there, ready to be bought, get in there and buy it. Last, but not least, it's Sally's lovely Lalique. It's great to see you again, Sally, and I love what you're wearing. That colour's this year's colour. -It's been a long wait, hasn't it? -It has been a long wait, yes. I had a chat to the auctioneer. You know what he said. He agreed with the valuation, it's good, everything's right about it. It's an early one, like I said, so, fingers crossed. It could either be 200, it could either be 300. -It could be a bit more, if we want to be greedy. Because, as you know, it's not an exact science. Right. It's going under the hammer now, good luck, Sally. This is the mistletoe bowl. Nice example, impressed mark. -I have interest here on the book. I'll start it at 150. £150 against you. £150 is bid. Any further, at 160? Thank you. 170 here. -It's against you at 200. 220. 220. Well, we didn't get the top end, but at least it went. -Very happy. Thank you very much indeed. but it does vary from room to room. So, enjoy the money. -Thank you. It's good fun. Today, I'm rolling back the years. I'm in Windsor Great Park, and this is Virginia Water. with my mother and father and sister and our dog, Bella, the boxer dog. called Windlesham, before I moved to Cornwall, when I was 12 years old. which was a gift to the park from British Columbia. It's still here, look at that. Oh, gosh, I am reliving some happy memories. The park started out as a hunting forest under William the Conqueror. 18th century under William Augustus, the Duke of Cumberland. the largest man-made body of water in the British Isles at the time. with follies and fishing temples built on the shore. of Leptis Magna, and ornamental cascades from the 18th century. and this is the most recent garden design. It was built in the 1930s and '40s by Sir Eric Savill. and classically designed gardens and exotic woodland. incorporating many new plants over the years. who runs Ascot Carriages. And here you can certainly embrace nature, can't you, Jo? -Hello. Thank you for meeting up with me. Who's this? -Hello, Delwyn. How old are you? -Yeah, he's very experienced. He's a Welsh Cob from Mid Glamorgan. Oh, he's lovely, isn't he? And how long have you been doing this? We've been very fortunate, we were invited to do this for the visitors a year ago. -So, this is your business? and we work here in these glorious surroundings. -And tours take about, what, half an hour to an hour? -You can book what you like, really, yeah. -Weddings, parties, anything like that? -Really? Have you had proposals on board? underneath the spreading oak tree, or by the lake. It's very romantic and they've been a 100% success rate. Well, thank you for letting me jump aboard today. Thank you. Delwyn, I'm relying on a smooth ride. I've come to talk to keeper Mark Flanagan. Hello, Mark. -This is lovely, isn't it? -And a great way to take in the view. The best way, I think. So, tell me a little bit about your work. What does the job title mean? Well, keeper of the gardens means that I manage about 1,000 acres of Windsor Great Park. Gosh, that's a great responsibility. areas, such as Virginia Water lake, the Savill and Valley Gardens. -Features like the totem pole. And what's the biggest headache, do you think? clear about what we're doing and why we're doing those things. must take years to actually see the fruits of labour, doesn't it? It does, I mean, obviously trees take quite a long time to mature. But we're putting new features in all the time. a contemporary rose garden. Very different from the Savill Garden. -And that's an instant splash of colour, isn't it? with all the lilies. This is a royal park. Do many of the royals still come and visit? of Windsor Castle, four miles from where we are here, through the park. -Any other plans for the future? to do some of the historical restoration work as well. very long term, and we have to take that into account. I guess the estate must attract hundreds of thousands of visitors now, each year? The estimate for the whole of Windsor Great Park is about two million visits a year. That's fabulous, and it's the perfect family day out, isn't it? Well, wonderful opportunities for all kinds of recreation. -You've got some lovely restaurants on site. so, it would be a great family day here. for my tour, it's brought back so many happy memories for me, especially as a young lad. because it colour coordinates in with our tablecloth, doesn't it? -Oh, brilliant job, brilliant job. This screams at you, Poole. which was started in...that range was started in 1963. And I bet you'll never guess where Poole comes from. You've done so well, yeah. It was founded on the quayside in Poole. Yeah, by the Carter family in mid, sort of, 1870s, I would think. really need to turn it over, but I better just had. and then, just impressed here, we have Poole as well. How have you come by this? I inherited it from my mother-in-law when she died. He died very young, unfortunately. Would he have bought this for his mum? would have come from Paul. It looks to be in good order. five or six years, in terms of value. ..that makes it attractive to people coming to the auction. So, I'd recommend 40 to 60 as an estimate. -That sounds fine. That sounds fine. Why have you decided to sell it, though? let someone else get the pleasure of it. And I can maybe put the money... and buy something else. -leave it just at that. and Elizabeth Talbot is ready with our next owners. -I understand you must be on half-term this week. -So, you've come along with your grandfather? Now, this. What can you tell me about this? -and we were clearing out the house, we found it in a cupboard. -but we just couldn't find the horn. -Oh, look at the horn. -That IS a shame. So, have you seen this before? has brought it over to my house and said, "Ben, we're going to Flog It." So, you had your day planned out for you by your grandad? -Well, I'll tell you a little bit about it. -Do you know what the original usage of these was? so that it could be played back in office use, basically. Now, the earliest ones were for office use. they were used for home entertainment, in effect. pieces, and perhaps a bit of human voice that was recorded as well. This one dates between 1900-1910. The most usual colour would have been black. reminds me of the early Hornby trains. -It's got that colour combination. -Same with the coach lines as well. Exactly right. Yeah, very much of its time. possibly imagine being brass, was actually also maroon coloured. -Wow, that would've been nice. -It would have been nice, wouldn't it? for it, but I think we need to look at about £100, £150 as an estimate. -Yeah? You're happy with that? -And would you like a reserve on that? See how the market takes it. because it is quite a rarity in its own right, even without the horn. -Yeah, yeah. Got your fingers crossed? the phonograph should do really well at auction. Knowing Phil Serrell, he won't be leaving anything to chance. He's zoned in on Rosemary, who has a large collection of postcards. You've got a fascinating collection here of postcards. -Well, as a family, we are well into postcards. most of these movie stars going back to 1904/1905. Then my mother inherited them from her. This is Granny's? This is Mum's? Where's yours? -Well, they are still to come, we are hoarding those. In years to come they will come on to "Flog It!" in 50 years' time. -Do you collect them, really? -Yes, yes. We have boxes and boxes. Do you think this is genetic? they are well into sending postcards, as well. I think this is.... I bet you're a wow at Christmas, aren't you?! I think we've got two lots here. These are all musical stars? -..that that lot is worth around £50-£80. Put a reserve of £50 on them with 10% discretion. -I mean, for me, these are so much more fun. -Your mum had a sense of humour, yeah? -and she passed away only about 18 months ago. Better get it right, Mum! I just think this is lovely. Look at this one here. "a couple of typists this afternoon!" I mean, you look at these sort of irreverent children in a way. and the Bunnykins plates that we get to sell. I just think they're lovely. They are just wizard. I think these are really collectable. -I think these will fly through £60-£90. But we should sell them as two lots. £60-£90 and we'll perhaps give them £10 discretion, if they have to. I think these will do very well. I think they are lovely cards. They are a great bit of fun. -Hopefully, we'll keep Mum happy, will we? happy by selling your unwanted collectables for a decent sum. We'll find out later how those postcards get on at auction. But first over to Elizabeth, she's with Paul. Your painting caught my eye, Paul. What can you tell me about it? -It doesn't belong to me, it belongs to my mother. It was handed down from her mother when she died. And you have come along on behalf of your mother today to...? Exactly, because she is in a care home being looked after. Is there anything that the family has found out about it up to this point? Do you know anything about it, or links to the artist, or anything? -I'm quite intrigued. I like the style of it. and use of the brushwork which caught my eye. It's signed very boldly at the bottom, Johnson Hayward. even with the facilities I have here today, which is quite frustrating. -was certainly showing a lot of potential. The sky is very good. I like the fluffiness of the clouds, very bright sky. through to the little town about there. it's very atmospheric, very bold, very vibrant. anything about the artist makes the valuation very difficult. you know, the last one sold by this gentleman was X, Y, Z. -so we're not pushing it too hard. -I would like it to be more, obviously. -I think that's fair. Is that all right? -So we'll do that and who knows? Well, we've had a marvellous day here and we've now found our final items. We're just going over to the auction room for the second time to put those valuations to the test. It's time for us to bid a very, very fond farewell to Wellington College. So this is what we're taking off to auction with us. Philip reckons Margaret's Poole plate will be a smash. Pete and his grandson, Ben, brought in the Edison phonograph. It's missing the horn but does include a number of musical cylinders. and photos collected by Rosemary's mother and grandmother. And the Hayward oil painting, valued by Elizabeth at £200-£300. Martin & Pole in Wokingham, and our auctioneer for today is Garth Lewis. We're starting with the first of Rosemary's two lots. but right now it's those film star photos. Going under the hammer right now, Grandma's inheritance. Rosemary, you should be hanging on to this, shouldn't you? Maybe, but they've been in the family a long time. -singers, all that kind of thing. -Let's hope we get that top estimate, Philip. -I'm hoping that we get any estimate at the minute. I think they should sell, shouldn't they? They should do. Strangely enough, it's gone very quiet. The tension's building. It is here. It is in these shoes! mostly actors and actresses. I have interest on the book here. We'll start at £50 against you. I have 50. Five, thank you, 55. -We have a bidder right near us. which is good. Keep your hand up, sir. 70? Five. 80. Five. 90. Five. -It is in the room at 95. Sold. It's £95. Gone, straight in, straight out. here's Paul with his mum's oil painting. Good luck, Paul, good luck. Fingers crossed. -We have a jam-packed saleroom. Have you been to this room before? -No, just poking my nose. Just poking your nose in. Today, hopefully, we'll be selling big time. We're looking at £200-£300. It's a wonderful oil. It's been kept under glass, so the condition is very, very good. -It was Mother's, wasn't it? -I like this, this is good. -That's my style, I could live with this. It's lovely and I hope other people like it too. We're going to find out. Let's find out if the bidders like it. Let's see what it's worth. Here we go. Lot 179, Johnson Hayward the artist. Pleasant country scene with a river meandering through water meadows. I can start the bidding at £100 against you. 100 bid. -A lot of picture for that money. It's against you at 140. -I'll have to pass the lot at 140, if you are all done. -Didn't sell. Got so close but not enough. That is worth every single penny plus another hundred pounds! We didn't overcook it at all. I thought it was a bit of a come-and-buy-me. I thought it was fair for what it was. -Well, now you've got a decision to make. take it home and live with it and enjoy it because Mum liked it. I might do that. Good idea. And it is Margaret's Poole plate. -"I want to be minimalist now." -I'm clearing out for the next lot! Oh, are you? What, there's stacks of it, is there? Stacks of Poole or just stuff? -Just stacks of stuff, boxes and boxes. -A bit of a hoarder, are you? Yes, I told Philip last time I am a magpie! -There's nothing wrong in that, is there? All these collectables add up over the years. It is going under the hammer right now. Poole Pottery, delphis pattern, circular charge. red and orange ground in that striking abstract design. I have interest on the book. I'll start at £32 against you. Is there any advance? 35, thank you. 38, here. 40, 42. 45, 48. Telephone's out. I am here at £48. Against you in the room. 50, new place. And five, here. 60. £60 if you are all done, I'm selling. I'm so pleased that Poole is still desirable. It is a good bit of 20th-century modern. -And they are still making it. You will miss that. -A cracking top end result. We're back with Rosemary, her photo sold for £95. and just as we start we have a late arrival at Rosemary's side. -Who have you brought along? What is your name? but she enjoyed sending postcards, collecting postcards. -So, the money is being divided between you. We will share it. We shall go out and enjoy ourselves. -Treat yourself to a bit of lunch. -You never know, do you? Plus supper as well. This could get top money. I like these. I think the McGills and the Lucie Attwells are so evocative. It is the Donald McGills for me. They are the best. So funny. look at this without being noticed or I got a clip round the ear. Paul Martin, there you are. Terribly naughty when you are only ten but so funny. and people put their hand up and bid on them. Donald McGill, Mabel Lucie Attwell amongst them. About 55 in total. I have a bid here starts at £35, against you. Any further at 35? 38. 40, here. 42, 45, 48. 50. Five. -I am out at 55. Selling again then. -He meant to have them, didn't he? It goes to show, postcards are so collectable. If you have something like that at home, we would love to see it. more about what is going on behind the scenes. because it could be you in the saleroom the next time. and let that one go at £55 and now to our last lot of the day. The Edison phonograph is valued at £100-£150. We're taking a few risks here. There's no reserve. but unfortunately Ben cannot be with us today. We do have Elizabeth. We are looking for around £150. It does have the horn missing. I like the colour and the condition of the rest of it is good. You had a few wax rolls as well. -It is all heading in the right direction. Hopefully it'll end on a crescendo. I wonder what the bidders think. Why are you selling this? so I thought, it's no good to me. If someone's got the horn, it may be a perfect match for someone. the original horn is missing. I'm sure we've had a look. What can I say here? £100 to start? 100. 80, if you like. I don't mind. £80 is bid. Thank you. Any further? 90, 95. 100. And ten. 120. It is near me here at 120. Against you on the telephone. -There is a phone bidder. -Battling it out for the commission. 280, telephone's out. £280, against you in the room. Are you all done? -It was worth looking in Nan's attic. -I didn't think it would get that much. Well over the top. £280. That is what it should be worth with the horn. Did you ever not think of trying to find a horn for it? -I wouldn't know where to look. -You never heard it played? No, my dad said they sat around and heard it. -It is the most wonderful sound. It is time stood still, isn't it? Well, that's it. It's all over. Another day in another saleroom. I hope you've enjoyed watching our show today. It was a bit of a mixed day, a few highs and lows. It goes to show, you can't predict what something is worth. See you next time on Flog It! Paul Martin brings the team to Wellington College near Windsor for the valuation day. 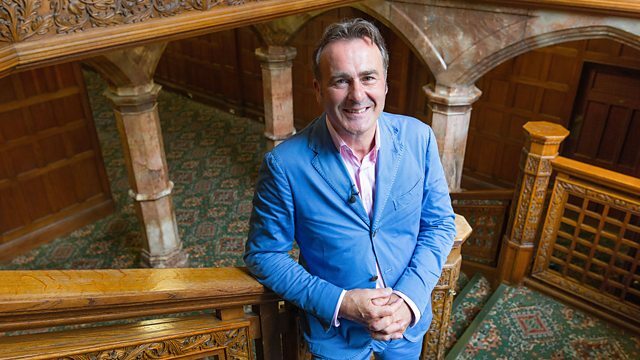 He's joined by Flog It! experts Philip Serrell and Elizabeth Talbot, as they value unwanted antiques and collectables before sending them to auction. Philip finds a collection of toys and learns a thing or two about Miss Piggy. Elizabeth has high hopes for some micro-mosaic jewellery - but will it appeal to the bidders? Paul takes time out to rediscover a place that he used to visit as a child - Windsor Great Park.